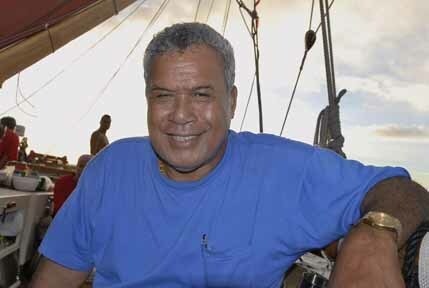 On March 5th, 2007, Hokule'a and Alingano Maisu - two Hawaiian double hull voyaging canoes - departed Chuuk in the Federated States of Micronesia for the tiny island of Satawal - to honor Mau Piailug, our mentor in the art of non-instrument navigation. 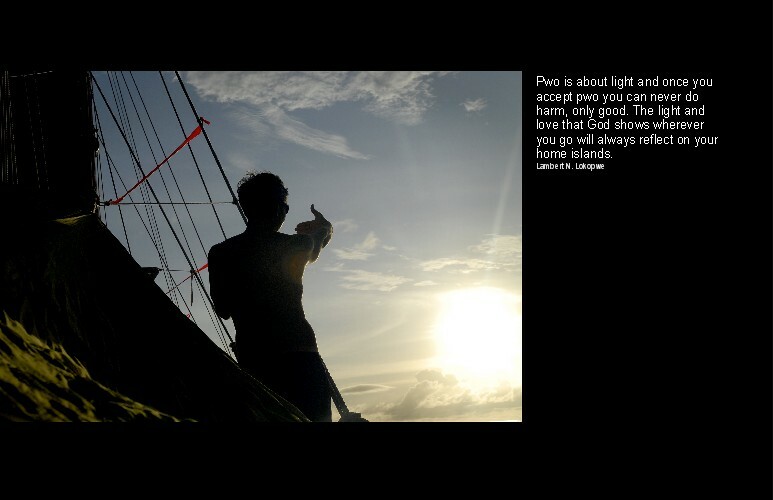 On Satawal, five Hawaiian navigators and eleven from Satawal, will be initited by Mau into the rank of Pwo - master navigator. 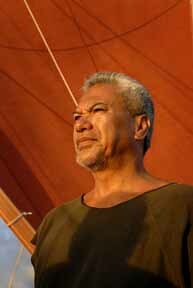 Accompanying Hokule'a on the voyage is Lambert Lokopwe - an initiated pwo navigator from the island of Pollap. He spoke with me about the voyage. 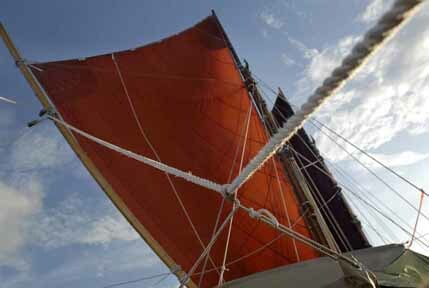 Maisu has been overhauling us since we cast off our double tow just before sunrise and by about ten in the morning she pulls alongside and douses her main sail – moving along under only a jib in formation with Hokule'a. A Pu sounds from Maisu. 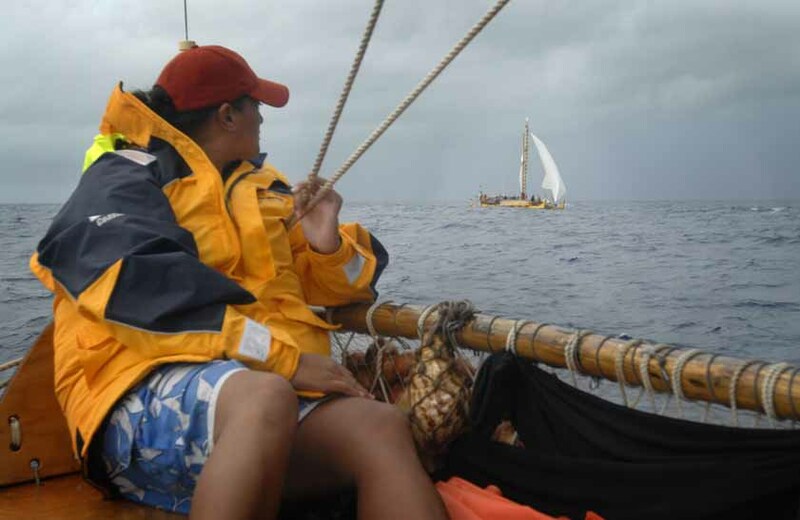 Maka responds aboard Hokule'a. In the afternoon on Monday, Bruce and Maka set the jenniker in light air from the starboard quarter. The crew seeks shelter on the port platform under a sunshade. Hokule'a ghosts with barely a murmur of wake into the path of the setting sun. Maisu and Kama Hele have dropped behind and are tiny specks under layers of towering cumulus. 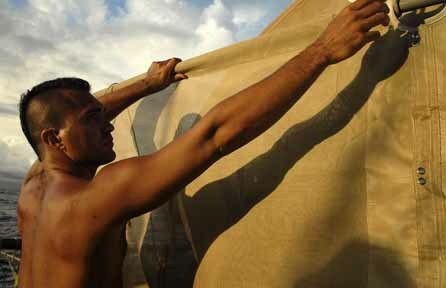 Billy Richards in Hokule'a's "shower." 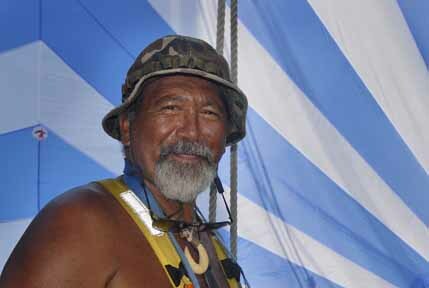 Billy is one of the original voyagers, having made the first ever journey aboard Hokule'a from Hawaii to Tahiti in 1976. Chad Baybayan steering on the way to Satawal. Chad is one of the five Hawaiian navigators who will be initited into the rank of Pwo. 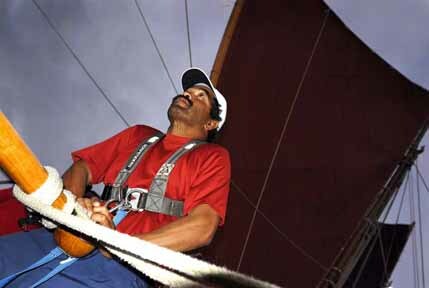 Behind him is Nainoa Thompson, another navigator soon to be initited. Monday - the ocean is spackled astern in powerful sunlight. Cumulous clouds build round the horizon – towering into the sky dead astern. 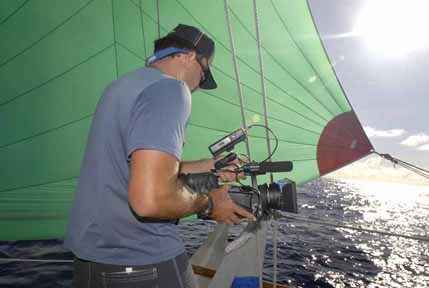 We are back-sighting a tall mountain in Chuuk Lagoon to keep Hokule'a on course. 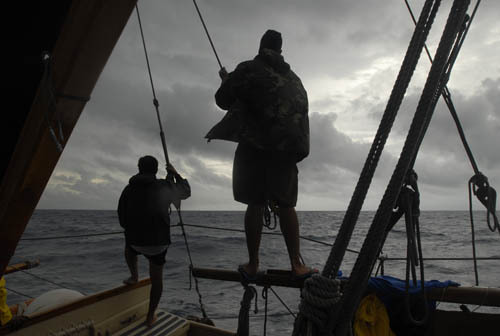 Dawn on Thursday - Hokule'a skims across steep swells that bear down on us from a little south of east. The canoe makes a whooshing sound – she is going so fast. The sky is ragged, thick with clouds at the horizon with wind-driven wisps flowing overhead. We are making five to six knots. Occasional rain squalls lash the canoe. Maka is a veteran sailor. Snake AhHee - another veteran. So many of us aboard are "elders" that Billy begins to call us the "Legacy Crew." 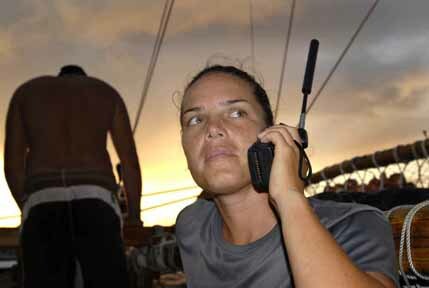 Kaiulani Murphey speaking by satellite phone to students in classrooms in Hawaii. Kaiulani is a student navigator, qualified to navigate the canoe without instruments. 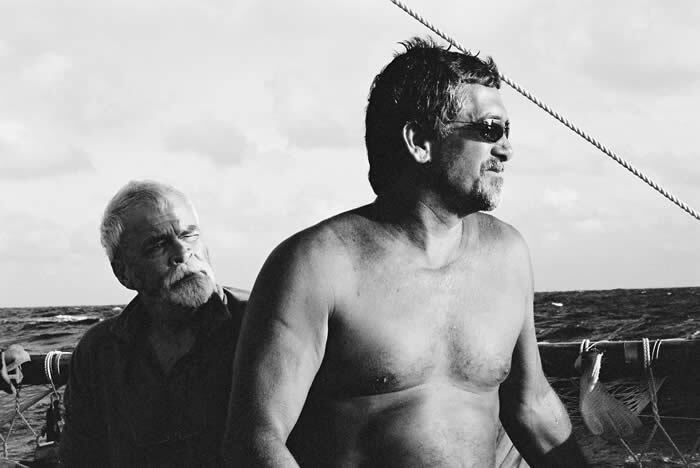 Thursday, three-thirty PM - Max stands on the starboard bow scanning the sea. Searching the distant horizon, he sees a thickening beneath ragged clouds. An island? Trained by long experience in these waters (Max is a native of Ulithi) he says nothing, eyeballing the horizon until he is certain. 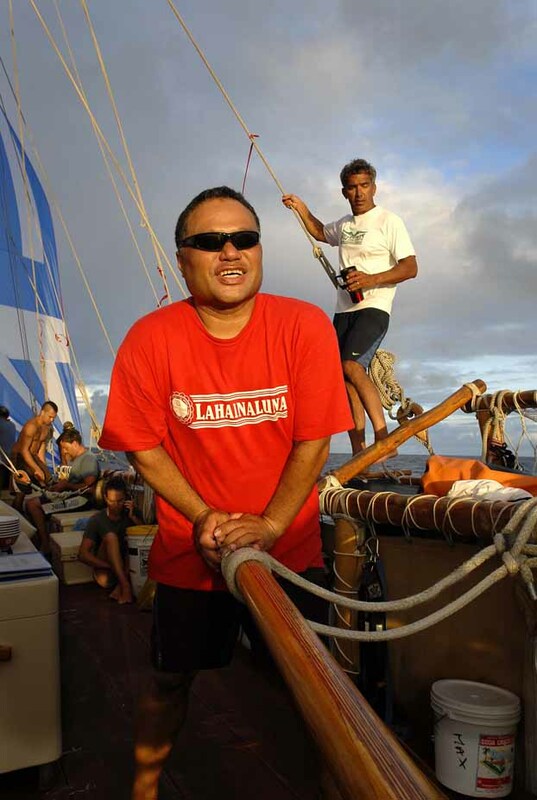 It is Satawal – and right off our starboard bow where Nainoa expected it to appear. Anchors are laid out forward – port and starboard – with ropes coiled in readiness. The wind is almost dead astern. 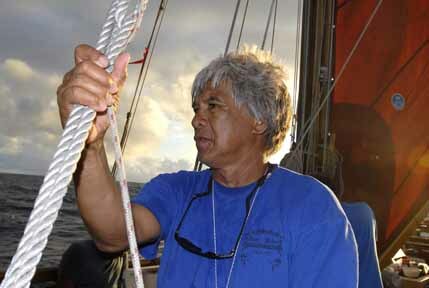 Nainoa stands on his familiar perch – forward of the navigator's platform – giving orders to prepare for our approach to the anchorage. The atoll is tiny. Even this close, it fills only a quarter of the horizon. Finally, the sweet aroma of land reaches us. As we swing past the island's southern point, we see a crowd on the the beach – tiny ants in the distance. Chicken skin. Then the singing reaches us - a soft undulating sound that blends with surf and wind. A pu is blown from the island and small boats circle the canoes – assisting with the final placement of our anchors. The crews of both canoes busy themselves cleaning the decks and stowing their personal gear. “Hup, hup,” comes from the bow as a team of sailors haul slack out of the anchor lines. We move forward under man-power, swinging close to the reef a short distance off-shore.